Six young Russian robotics engineers beat over 80 teams of young engineers from 36 countries to become one of the most acclaimed teams at the FIRST Lego League international competition, with their project on tackling floods finishing third overall. 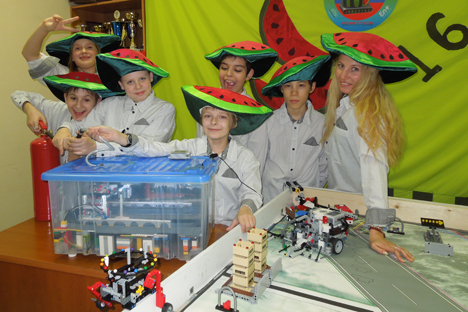 Six Moscow-based young robotics engineers became one of the most acclaimed teams at the FIRST Lego League (FLL) international competition, held in St. Louis, Missouri on April 23-26, with their project on tackling floodss with a LEGO robot. The LEGO Flood Saver came top of all flood defense ideas and finished third overall in the competition, an event which brought together over 80 teams of young engineers from 36 countries. Arbuziki (‘small watermelons’ in Russian) is a team of “sporty, merry, really brainy guys” as they call themselves. Aged between 10 and 12, all of these kids are passionate about math, Java coding and programming robots. The theme for this year’s competition in St. Louis, which attracted over 800 participants from all over the world, was “Nature’s Fury”. The children examined ways of dealing with earthquakes, floods, typhoons and other natural disasters by designing, building and programming autonomous robots based on LEGO Mindstorm technologies. Arbuziki created a Flood Saver consisting of a robot pump and water-filled barriers. The children designed a model of a river bed that automatically fills with water, imitating heavy rains. When the water level reaches a critical point, a sensor embedded in the robot switches on a pump. The robot starts pumping the water into inflatable rubber barriers resembling sleeves that are installed on the both sides of the embankment. The system is similar to the technology of water-filled dams that is widely used all over the world. The main difference from the existing method is that this system uses a robot that tracks critical water levels and automatically starts pumping the water. According to the young inventors, the advantages of the water-filled barriers are obvious. “If we use a pump of capacity of 80 cubic meters of water per hour, we will fill a 25-meter barrier with water in just 15 minutes,” said Ilya Bulygin, 10, one of the team members, who has been doing robotics for two years and sees his future career in the sphere. “To build the same size dam from sand we need 30 tons of sand or 600 sandbags of 50 kilograms each. It would take a rescue team of 30 people about 4.5 hours to perform such work. But people get tired quickly. Compared with a workforce, our robot never gets tired and starts working immediately,” added Alex Shekhovtsov, a 12-year-old Java programmer. “First of all we would install barriers in places where there is a danger of damaging historic, cultural and other important sites, to ensure they stay safe in the case of flood,” says Georgy Grechko, a 10-year-old robotics specialist. The St. Louis competition is the second global-scale event in which Arbuziki have participated. Last year they traveled to the U.S. to showcase the EyesTronic Cap, a smart hat that helps to navigate in the dark and in air pollution. The cap works on a technology similar to that of parking sensors: As a person wearing a cap approaches an obstacle, a LEGO robot installed on top of the hat starts beeping with a varying frequency depending on the wearer’s proximity to the obstacle. Arbuziki have also won numerous awards at the Russian nationwide robotics festival, Robofest. Set up in 2007, Robofest has become the biggest robotics festival in Europe. In 2013 it was held for the fifth time and gathered more than 2,200 pupils and students from 45 regions of Russia, as well as their peers from abroad. The idea of Robofest was born in 2007 when Oleg Deripaska, one of Russia’s richest businessmen, visited the FIRST global robotics competition to see hundreds of children and teenagers enthusiastically build robots, eager to put their skills into action. At that moment, there were no such engineering initiatives or programs in Russia and the support of robotics became a key focus for Deripaska’s Volnoe Delo Foundation. The foundation enables children and young people aged from 8 to 25 to study mechatronics and programming in resource centers created within schools, colleges, technical schools and universities. Over 10,000 children across Russia’s 47 regions took part in the program. Russia now faces a decline in the popularity of engineering professions and is trying to restore the attractiveness of the word ‘engineer’ for children, many of whom strive to become celebrities, footballers, entrepreneurs or heads of multinational corporations. When asked about their career aspirations, all of Arbuziki team members admitted they wanted to become “mathematicians, robotics engineers and programmers.” It appears that the first results are already here.